It is said that the former owner, an elderly man, used to sit in his rocking chair on the top floors and look out the window at the river. After he passed away, his chair was stored in the closet, but the chair mysteriously appears at the window, even when the door is locked. Maids there have reported hearing footsteps in the hall and feeling something tug playfully at their hair. 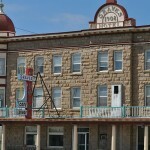 I currently live at the Graves Hotel in Harlowton, MT. I have encountered the male ghost several different times. He listens to pump organ music and resides in room 16 on the second floor. He asked me how my day was as I passed by his room, I walked on two more steps, thought to myself I know if I turn around no one will be there, but I did, I could not see a thing, turned and said, “sorry way to busy to talk today!” The room across the hall from room 16, well that door shuts sometimes all by itself after you go out of it. I also had a cowboy pass by me three times all on the main floor in three different locations. All I saw was like a faint image, the outline of the vest and very tall. The other experience was in the early hours of the morning, I was coming down the stairs, stopped after the third step, as I heard a cough from what seemed to be coming from a large man, it was like a cigar smoker cough. I turned around and went back upstairs to get my husband, we found no one at all on the first floor.